Rich has a band, Palace Family Steak House (not to be confused with the recently departed and much beloved Palace Steak House at Cesar Chavez and Mission… no, wait, it’s totally to be confused with that). Palace Family Steak House offers up a rollicking rock opera of love, angst, and potato coiffures, and tends to be a real crowd-pleaser. The centerpiece, the star of the show, is always Steak itself. 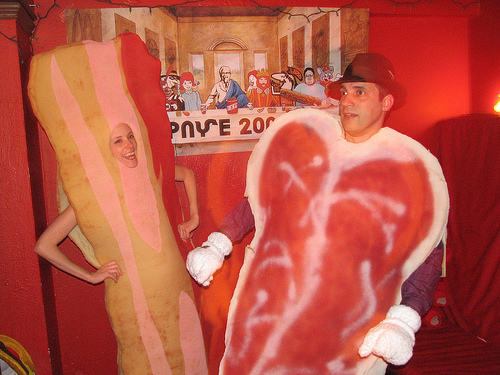 Rich’s best friend from college, Jessica, created the steak costume from foam, paint, glue and love. Meanwhile, in a different sphere of the same San Francisco Bay Area, Humu needed a Halloween costume. Wanting something comfortable, something non-skank, and something uniquely suited to her stick-like body, “bacon” popped into her head. A few hours and a couple of foam sheets and paint cans later, and she had a swell bacon costume for the ages. Let’s fast forward a couple years, and shift our attention to Chip Dalby, drummer for Palace Family Steak House. Chip, upon hearing about Humu’s bacon costume, said to her “you know, a friend of mine has a steak costume, you should probably meet.” Chip brought Humu to a PFSH show at Brainwash, an odd little laundromat/cafe in San Francisco. Before the show, as Chip set up his drums, Humu and Rich met. The earth shook. No really—just moments after our initial meeting at 8pm on October 30, 2007, the Alum Rock earthquake sharply jolted the room. We continued our conversation, and Humu greatly enjoyed the Palace Family Steak House spectacle. We met once again at Chip’s birthday party a few weeks later. Again, a short conversation was had, and the seeds of future sparks were planted: Rich learned of Humu’s interest in tiki bars, and Humu learned of Rich’s burgeoning interest in cocktails (thanks to Joy of Cooking). We saw each other several more times as part of a larger group of Chip’s friends during the early part of 2008. On January 25, 2008 we finally got our act together and had our first date: dinner with Rich’s friends Erik and Michele, followed by a birthday party for Rich’s friend Nicole. We’ve been a nauseatingly sweet couple ever since. This is my favorite picture of you guys. oh boy, how I love that Erik & I were witnesses to the first date. It was indeed apparent that you two were getting along famously that night. Just friends, HA! and the rest is history. double triple woot.